With the smallest touch of the Breeze GL, the tricycle maneuvers just like a baby carriage. The unique navigator button on the mudguard makes it easy to transform from pushchair to tricycle. With the built-in suspension, your child experiences a comfortable ride. From 10 months, the baby uses the safe footrest and is protected by the safety support while the parents push and steer the tricycle. The baby enjoys the ride and develops self-confidence, balance and motor skills. 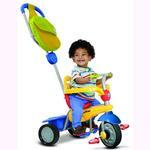 From 24 months, the tricycle becomes an exercise tricycle, where your child can learn to steer themselves. From 30 months, the push rod can be removed and your child can drive independently.